* Formation chance through 48 hours...low...near 0 percent. header WTNT33 KNHC and under AWIPS header MIATCPAT3. WMO header WTNT23 KNHC and under AWIPS header MIATCMAT3. A gradually developing wave in the eastern Atlantic dubbed Invest 91L is well positioned to take a steady course toward the Greater Antilles, and perhaps continuing further west more than a week from now. 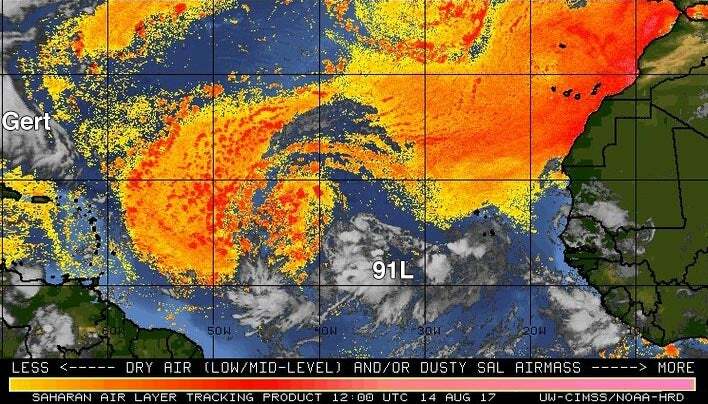 Much like its predecessor (the wave that became TD 8), 91L is starting out as a complex, elongated system. A strong tropical wave that moved off Africa on Saturday has been catching up to another wave located to its southwest, south of the Cape Verde islands. The complex maintained a large amount of strong convection (showers and thunderstorms) on Sunday, despite the usual afternoon minimum in convection over the tropical oceans. Given its dual structure, it may take a day or more for 91L to organize around a single focal point. Assuming it does, conditions are quite favorable for more development through at least midweek. The atmosphere surrounding 91L, and downstream of it, is consistently moist (mid-level relative humidity close to 70 percent). 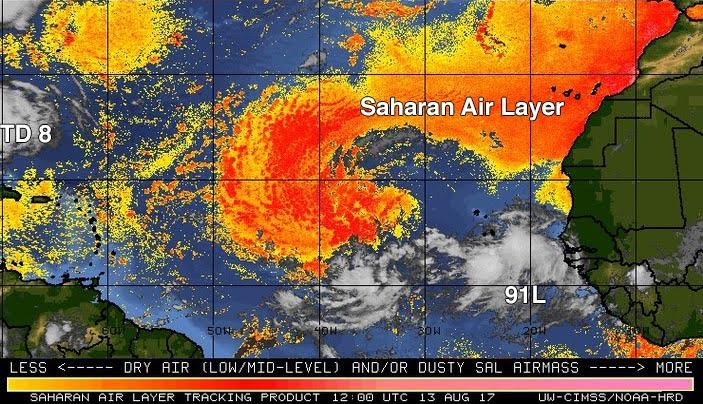 The Saharan Air Layer (SAL) is far enough northwest that it should not pose any immediate issues for 91L (see Figure 2 below). Wind shear along 91L’s path is predicted to be mostly light (less than 10 knots) through Tuesday, and sea surface temperatures of 27-28°C (82-84°F) are about 0.5°C to 1°C above average for this time of year. We can expect all of these factors to help 91L strengthen steadily once it develops a dominant center of circulation. In its tropical weather outlook issued at 8:00 am EDT Sunday, August 13, 2017, the National Hurricane Center gave 91L (right) a near-zero chance of development through Tuesday and a 20% chance through Friday. Given the favorable environment around 91L, those odds may be nudged higher before too long. Figure 2. The Saharan Air Layer (SAL) analysis from 8 am EDT Sunday, August 13, 2017, showed that dry Saharan air lay well to the north of tropical wave 91L, and it should not be a major impediment to development early this week. Image credit: University of Wisconsin/CIMSS/NOAA Hurricane Research Division. 91L is moving almost due west, and that general motion is expected to continue throughout this week, with a slight northward bend over time. A large, flat upper trough known as a tropical upper tropospheric trough, or TUTT, will be stretching west across the subtropical Atlantic ahead of 91L. This TUTT may exert some increased wind shear on 91L later in the week, but the trough is predicted to continue westward and weaken over time. The upper-level westerly flow associated with the TUTT might even provide an outflow jet for 91L late in the week. The global models from 00Z Sunday provide some support for 91L posing a threat to the northern Caribbean or Greater Antilles next weekend, and possibly to Mexico or the United States beyond that point. The 00Z Sunday operational runs of the GFS, UKMET, and European models all develop 91L to various extents by next weekend, taking it near or just north of the Greater Antilles by that point. The GFS is the strongest of the three with 91L, and the Euro the weakest. About half of the Euro model ensemble members from 00Z Sunday, and all members of the GFS ensemble, develop 91L into a tropical cyclone by Thursday. Nearly all of the Euro and GFS ensemble members that develop 91L track it across or near the Greater Antilles, and several ensemble members continue the system westward into the Gulf of Mexico or into the western Atlantic near or north of the Bahamas. At this early stage, it is far too soon to know how strong 91L might become, or how a trek across the Greater Antilles would affect its strength downstream, but the supportive environment and the track forecast imply we might be watching 91L for quite a few days to come. Storm Gert, located several hundred miles west-southwest of Bermuda. * Formation chance through 5 days...medium...60 percent. Just maybe we will have something to watch this week and next week? Is it too soon to ask for a nice rainmaker for South Texas??? (08-14-2017 10:21 AM)Kelly_Jernigan Wrote: Just maybe we will have something to watch this week and next week? Is it too soon to ask for a nice rainmaker for South Texas??? Above: MODIS true-color satellite image of 91L on Monday morning, August 14, 2017. Image credit: NASA. A tropical wave in the central tropical Atlantic (Invest 91L) has the potential to develop into a tropical depression late this week as it moves westwards at about 15 mph, but the forecast has a lot of uncertainty. 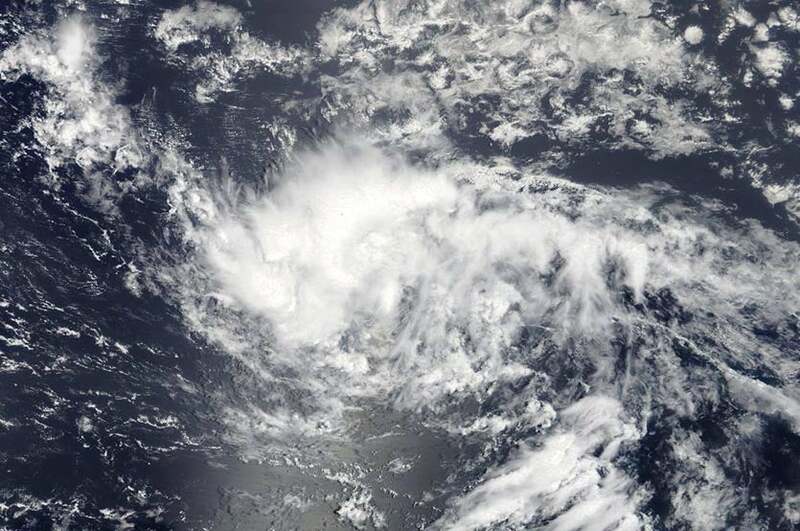 Satellite images on Monday morning showed that 91L was a complex, elongated system that stretched along a 700-mile long portion of the central tropical Atlantic between 9°N and 14°N latitude. Heavy thunderstorm activity had increased since Sunday, but remained disorganized, and only a modest degree of spin was apparent in the visible satellite imagery. Wind shear was moderate, 10 – 20 knots, and sea surface temperatures were 27.5°C (82°F)--about 0.5°C to 1°C above average for this time of year, and adequate for development. The Madden-Julian Oscillation (MJO), a pattern of increased thunderstorm activity near the Equator that moves around the globe in 30 - 60 days, is currently in a phase that is favorable for supporting tropical cyclones in the Atlantic, as pointed out by tweets from The Weather Company's Michael Ventrice. Figure 1: The Saharan Air Layer (SAL) analysis from 8 am EDT Monday, August 14, 2017, showed that dry Saharan air lay well to the north of tropical wave 91L, and should not be a major impediment to development early this week. Image credit: University of Wisconsin CIMSS/NOAA Hurricane Research Division. Conditions appear favorable for development through at least Thursday. The atmosphere surrounding 91L will be moist (mid-level relative humidity of 65 – 75%), and the dry air of the Saharan Air Layer (SAL) is far enough north that it should not pose any immediate issues. Wind shear along 91L’s path is predicted to be mostly moderate, 10 – 20 knots, through Thursday, and sea surface temperatures will be 27.5°C (82°F). All three of our top models for predicting tropical cyclone genesis—the GFS, European, and UKMET models—predicted in their 0Z Monday runs that 91L would develop into a tropical depression this week. However, the forecast is a very complex one, since it is not obvious where the center of 91L end up forming along its elongated axis. The 0Z UKMET model had 91L forming along the western edge of this disturbed weather area, resulting in a tropical depression arriving in the Lesser Antilles Islands on Thursday. The European and GFS models had a more easterly formation location, resulting in arrival of the storm near or just north of the Lesser Antilles on Friday. And we should not be confident that 91L will develop at all this week, since the most recent 6Z Monday run of the GFS model predicted no development of the storm. The 0Z Monday ensemble runs reflect the ongoing uncertainty. 91L becomes a tropical storm in about 75% of the Euro ensemble members, but only about 20% of the GFS members--and there are major differences among ensemble members in the various projected tracks as soon as 3 or 4 days from now. 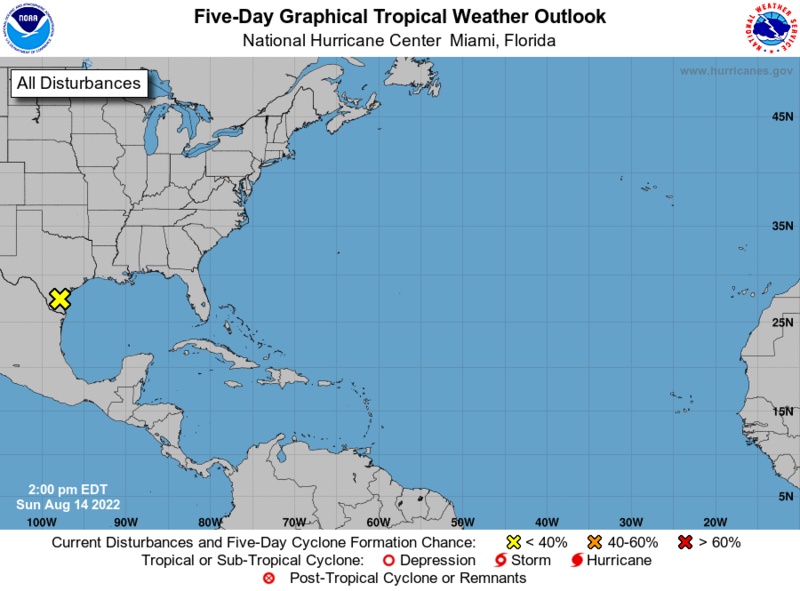 In its tropical weather outlook issued at 8:00 am EDT Monday, the National Hurricane Center gave 91L 2-day and 5-day odds of development of 20% and 60%, respectively. Gert, located several hundred miles west of Bermuda. * Formation chance through 5 days...medium...40 percent. hundred miles west-southwest of the Cabo Verde Islands. westward to west-northwestward at 15 to 20 mph. * Formation chance through 48 hours...low...10 percent. westward to west-northwestward at about 15 mph. Figure 2. MODIS true-color satellite image of 91L on Tuesday morning, August 15, 2017. Image credit: NASA. A tropical wave located near 14°N, 41°W in the central tropical Atlantic at 8 am EDT Tuesday (Invest 91L), remains disorganized, but has the potential to develop into a tropical depression late this week as it moves westwards at about 15 mph. 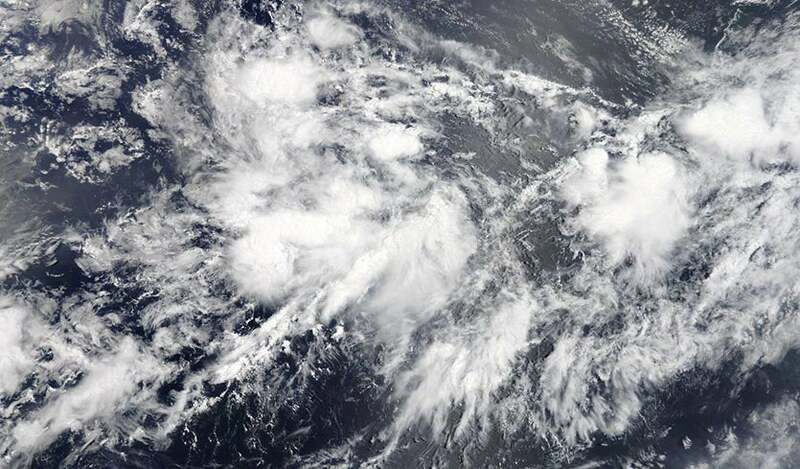 Satellite images on Tuesday morning showed that 91L had only a limited amout of disorganized heavy thunderstorm activity, though the disturbance had acquired more spin since Monday. Wind shear was moderate, 10 – 20 knots, and sea surface temperatures were 27.5°C (82°F)--about 0.5°C to 1°C above average for this time of year, and adequate for development. 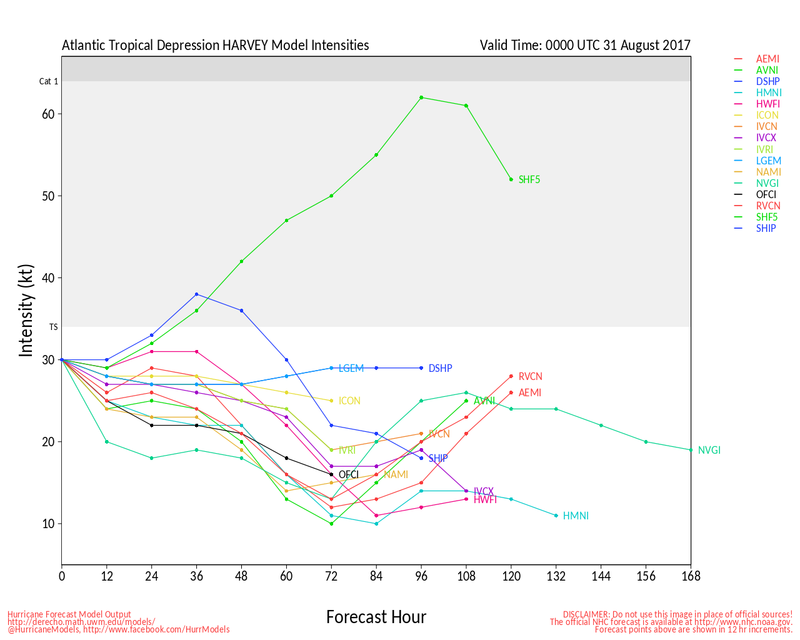 The atmosphere surrounding 91L had dried since Monday, with relative humidity at mid-levels of the atmosphere at 60%, down from 70% on Monday morning. This drier air was likely keeping heavy thunderstorm activity down. Conditions appear adequate for development through at least Friday, though the atmosphere surrounding 91L will be a bit on the dry side (a mid-level relative humidity of 55 - 60%). Wind shear is predicted to be mostly moderate, 10 – 20 knots, through Thursday, and sea surface temperatures will be warm, 27.5 – 28.5°C (82 - 83°F). Our top models for predicting tropical cyclone genesis—the GFS, European, and UKMET models—were much more restrained about developing 91L in their 0Z Tuesday runs, compared to their Monday morning runs. The European model did not develop 91L; the GFS model showed weak development on Thursday and Friday, then the storm dying in the Eastern Caribbean. The UKMET model was the only one of the three that supported the idea of 91L becoming a weak tropical storm, predicting that 91L would attain that status by Friday as it moved through the Lesser Antilles Islands, then weaken as it traversed the eastern and central Caribbean early next week. In its tropical weather outlook issued at 8:00 am EDT Tuesday, the National Hurricane Center gave 91L 2-day and 5-day odds of development of 20% and 40%, respectively. Their forecast from 24 hours previous had given 5-day development odds of 60%. Gert, located several hundred miles west-northwest of Bermuda. * Formation chance through 48 hours...low...30 percent. Gert, located a few hundred miles northwest of Bermuda. and it is expected to cross into the Caribbean Sea on Friday. Lesser Antilles should monitor the progress of this system. west-northwestward at 15 to 20 mph during the next several days. large area of disorganized showers and thunderstorms. mph during the next several days.